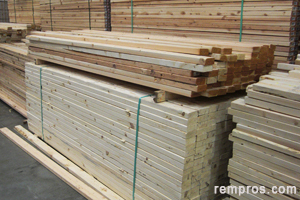 Lumber for construction purposes available in variety of different sizes. Nominal dimensions which identify certain board, beam or post do not represent its actual parameters. Lumber measurements in width and thickness normally 0.25 inches (6 millimeters) – 0.75 in (19 mm) smaller than nominal sizes. At the same time, length of lumber normally does not have nominal dimensions and only actual size determine. Most lumber for residential construction comes from 8 feet (244 centimeters) to 16 ft. (488 cm) long with 24” (71 mm) increment. But typically 8’, 10’ and 12’ are common length. Some lumber might be sold in odd sizes such as 7 or 9 feet, but it is rare and might be available just from certain lumber retailers. Some 2x4s and 2x6s sold as precut 92 5/8” long option what is a standard length of wall studs. Depending on wood species there are softwood lumber and hardwood lumber. For framing houses as well as many outdoor structures such as porches or decks softwood timber typically used. Hardwood boards widely used for building decorative wooded elements by carpenters while finishing interior of custom homes, or as a higher quality and durability decking option. Nominal dimensions are known names for a certain lumber only. Actual sizes are exact lumber measurements thickness x width in inches (imperial units). Measurements in milliliters determine lumber sizes in metric system. For the hardwood lumber thickness of boards determine for standardization purpose. Width, length and thickness of lumber are not only factors of price determination. Depending on a quality, treatment process and wood species the cost of lumber might vary even if the actual dimensions will be identical. Wood species will determine the weight at a first place. Pine 2x4 stud with actual dimensions 1.5” x 3.5” x 96” will weigh about 10 pounds (4.5 kilograms) of about 1.3 lb per each foot. The weight will proportionally increase or decrease depending on actual lumber measurements. Hardwood lumber is typically heavier. The weight will also depend on wood moisture content. Same size and species pressure-treated lumber might be heavier than kiln dried just because of a treatment and different moisture level.